As bags are being unpacked and books bought for the new semester, a splash of color in a drab dorm room or tiny apartment will bring a smile to your favorite college-bound kid’s face and brighten up their academic year. The croton is the perfect houseplant for sending a student off to college and will be a welcome reminder of home. Easy to care for with cheerful, multicolored leaves, the croton will thrive in a sunny corner from orientation until finals week. While there is a genus of plants called Croton, with hundreds of different species around the world, the common name “croton” is used in reference to the plant Codiaeum variegatum– a specific species of flowering houseplant with leaves that come in a rainbow of colors. Native to parts of southern India, the colorful croton can grow into a large shrub but is sold as a houseplant suitable for smaller spaces in pots and containers. 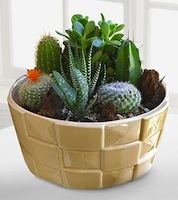 In tropical climates they make striking landscape plants with their large, flat, rubbery leaves that come in yellow, red, green and bright orange. In a container on a sunny windowsill, they will grow slow and steady over the course of a semester. 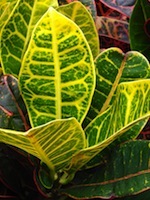 Crotons are specifically cultivated for the vibrant colors of their foliage. Leaves of some varieties are long and wide, reaching more that four inches across each leaf even when plants are small. Other varieties may have lobed or narrower leaves that twist and turn. The green edges are lines and crossed with veins of yellow, orange and red- all in the same leaves. These colors are created as pigments produced in the plant such as anthocyanin (red), lutens (yellow) and carotinoids (orange). 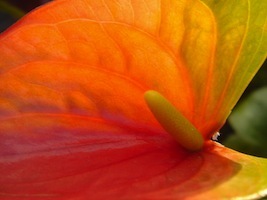 The brighter the light exposure to the plant, typically, the brighter the colors of the leaves. If a croton is not getting enough light, it will start producing more chloroplast to capture any available light with its chlorophyll, resulting in a plant with more green in its leaves. If your student is a Biology major, try asking them to figure this out on their own! Crotons are easy to find and often available at florists, garden centers and any place houseplants are found. While primarily grown for their foliage, the plant does produce a funky spike of white flowers from time to time when given plenty of sunlight. 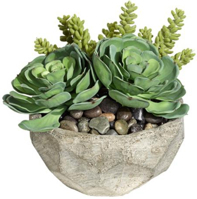 Send off your student with instructions to water it regularly and give it a lot of light and it should do beautifully right through graduation.